The robust stainless steel case and the battery power enable a flexible operation of the pressure gauge model DG-10 in various applications and industries. 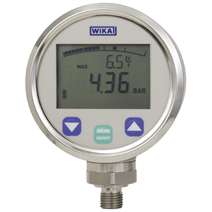 For a precise and quick on-site reading of a pressure value, a digital indicator is the ideal solution. The bargraph display and drag pointer function integrated into the display, as well as retrievable Min/Max peak values, enable effective analysis of the measuring point. Through its rotatable case, the digital pressure gauge model DG-10-E can be easily adapted to local conditions. The backlighting also provides easy readability of the display in poor lighting conditions. Additional programming functions of the pressure gauge model DG-10 are: Automatic power-off, tare function and password protection. There is unit switching between the units bar, psi and MPa already integrated into the standard model DG-10-S.
For decades, sensors manufactured by WIKA have guaranteed high accuracy, long-term stability and repeatability in industrial pressure measurement. Depending on the measuring range, the most appropriate sensor technology is used (metal thin-film or ceramic).